McDonald’s released this new brochure for their McDo party. 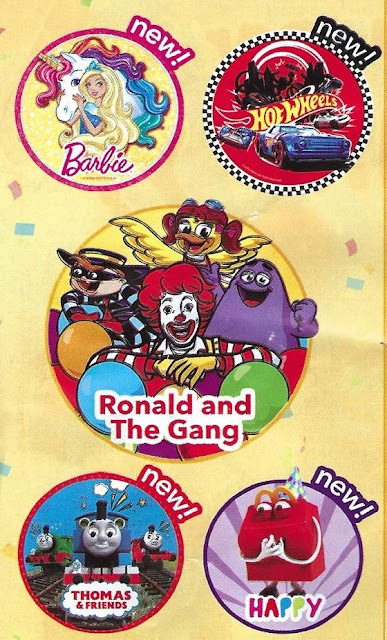 What I immediately saw in this McDonald’s Party brochure are these new McDo party themes: Barbie, Hot Wheels, Thomas and Friends, and Happy. Ronald and the Gang McDo Party Theme is still available. Also note that yu can request for additional guest giveaways and game prizes for additional cost. Mcdo Party Food Mix 1, which is composed of Mcspaghetti, regular fries, sundae, and drink. Mcdo Party Food Mix 2, which is composed of 1-piece chicken Mcdo with McSpaghetti, regular fries, sundae, and drink. Mcdo Party Food Mix 3, which is composed of McSpaghetti, sundae, drink, and 1 Happy Meal toy. 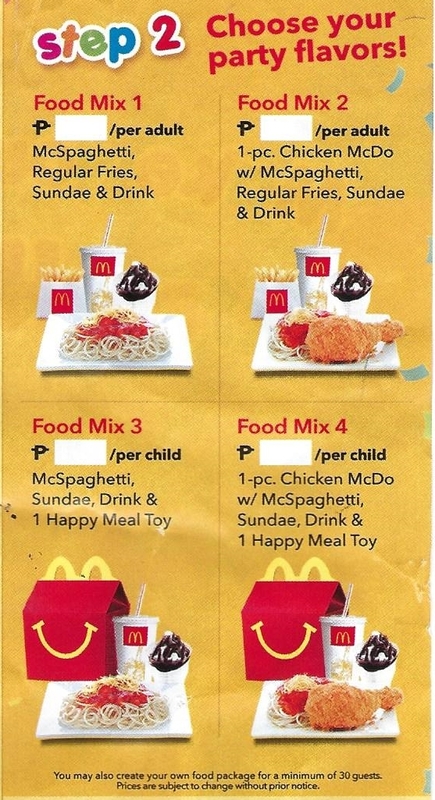 Mcdo Party Food Mix 4, which is composed of 1-piece chicken Mcdo with McSpaghetti, sundae, drink, and 1 Happy Meal toy. Make-Your-Own McDo Party Food Mix, which allows you to make your own McDo Party Food Mix if you have 30 guests or more. 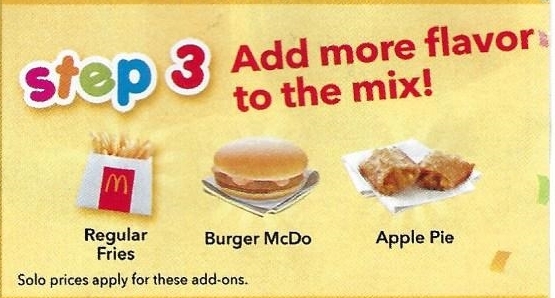 You can add regular fries, Burger McDo, and apple pie. Take that solo regular prices apply to these add-ons. 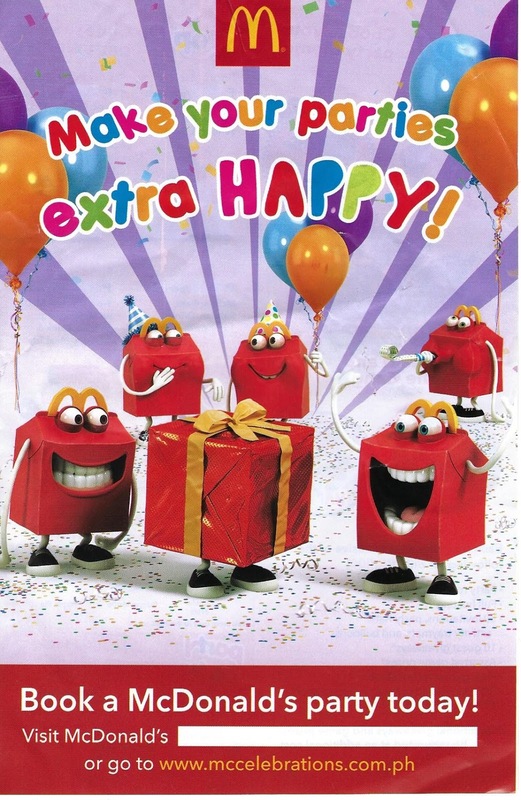 Unfortunately, McDonald’s removed the prices so you will not know how much a birthday party in McDonalds will be. I suggest that you ask McDonald’s staff about the prices of McDo Party Food Mix, party items, and add-ons. Food bill worth 8,000 pesos to 11,999 pesos will get you a free 500-peso worth of McDonald’s Gift Certificate. 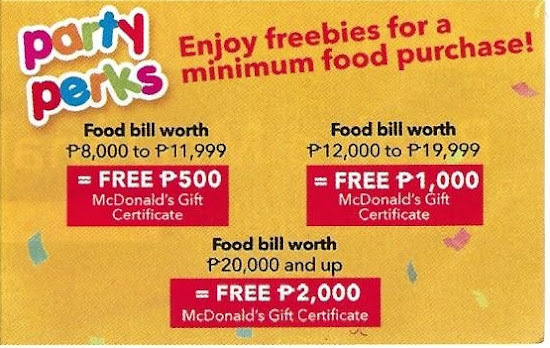 Food bill worth 12,000 pesos to 19,999 pesos will get you a free 1,000-peso worth of McDonald’s Gift Certificate. That’s all the information that you can get from the McDo party brochure. You can get a copy of this brochure from any McDonald’s store that hosts parties and events. 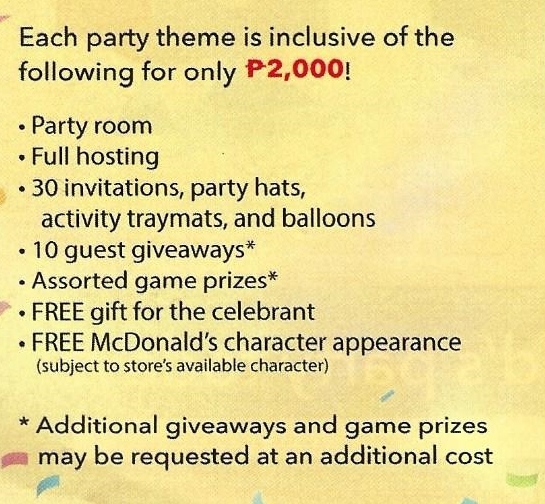 Want more information about McDo Party? Read McDo Party Package 2018.